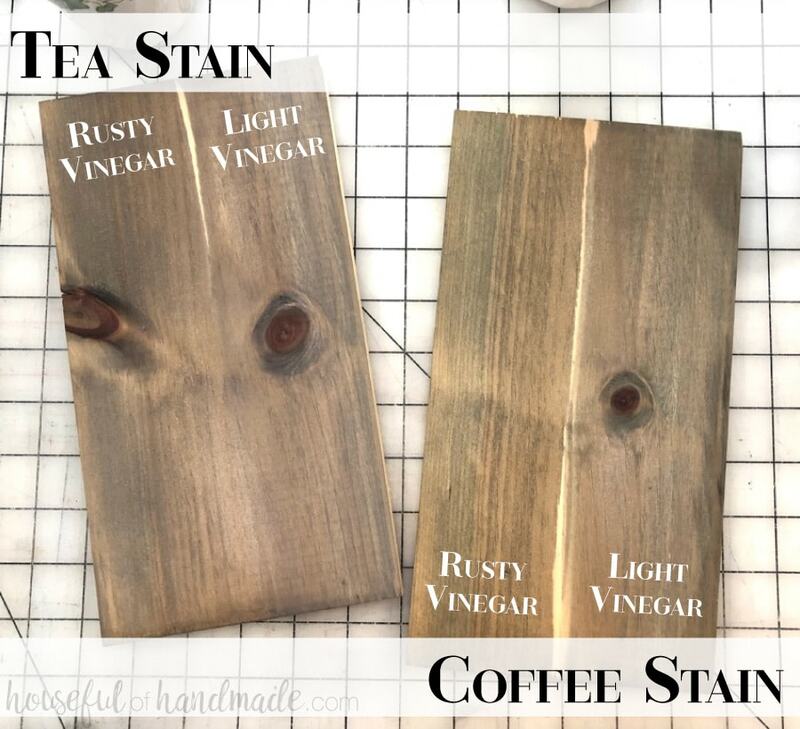 Make a simple natural wood stain with steel wool, vinegar, coffee or tea. I love using homemade natural wood stain. It is a beautiful option for a rustic or weathered wood stain. And even better, this stain is cheap! 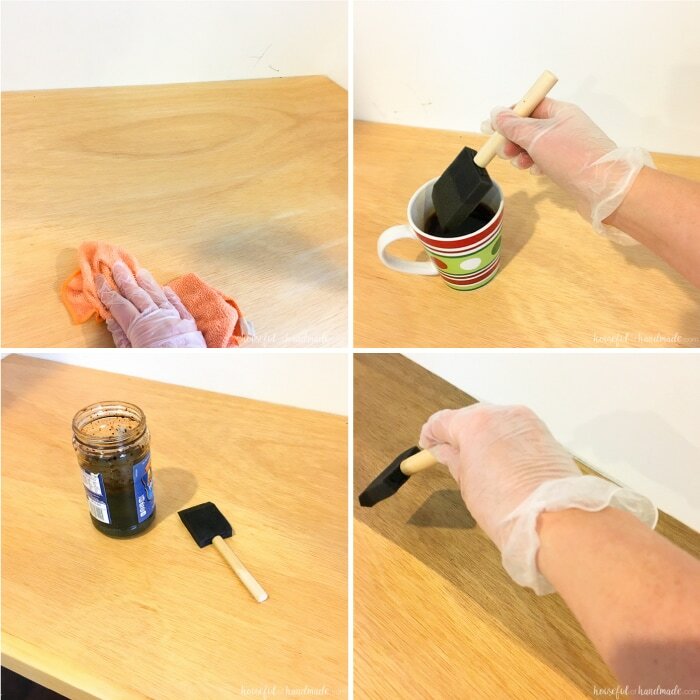 Its so easy to make a DIY wood stain out of steel wool and white vinegar. But I also love adding a layer of coffee or black tea to give it even more depth. I have used this inexpensive homemade wood stain for many projects. All of the wood in my office & craft room was stained with this natural wood stain. Which was great since we remodeled the entire room for only $100. 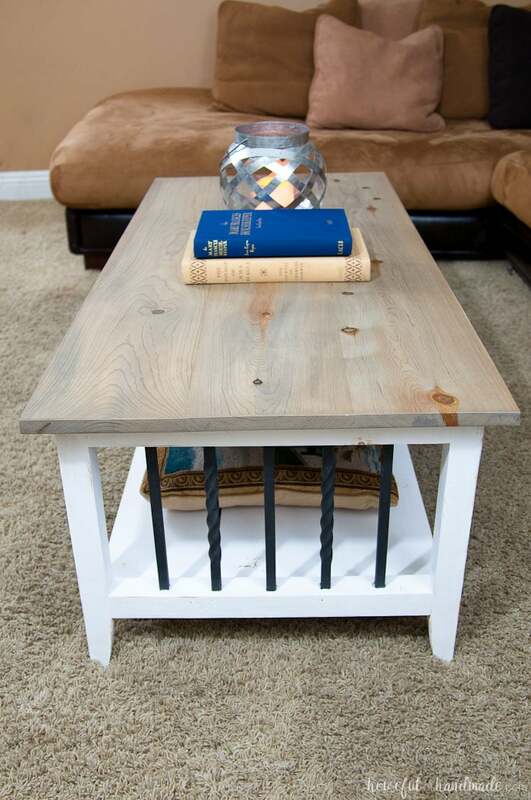 The top of this farmhouse coffee table was also stained with the natural wood stain, but with a few differences. I love the difference in the color. Part of the color difference was due to the wood species, the other part was due to the wood stain recipe. Since I have used this stain so much, with varying results, I thought it would be fun to document the way the differences in the recipe looked. That would make it easier to repeat my favorite combination on future projects. So I put together video on the differences in the DIY natural wood stain. It’s fun to see how the wood reacts to the variations of steel wool, vinegar, coffee and tea to create a variety of beautiful stains. I like using leftover food jars to make and store my DIY wood stain in. This recipe does not have exact measurements. The fun part of natural stain is that it can be adjusted and tweaked to get difference colors from the same (or similar) supplies. Start by soaking the steel wool in the vinegar in a glass jar. Let is soak for a couple days for a weathered grey wood stain. To keep the stain light, remove the steel wool from the vinegar. Let is soak until the vinegar becomes orange with rust for a deeper, browner stain color. You can paint just the steel wool and vinegar on the wood, but I have found better results by including a second element: brewed coffee or tea. The coffee or tea will give the wood slightly different coloring. I found the coffee had a greener undertone to the brown and the tea was a warmer gray color. A strong brew will give you the most color. Make sure to let it cool before using. Make sure to test your natural wood stain on a scrap of the type of wood you are using to see how it reacts before using it. Here is a picture of teh finished experiment between my two vinegar mixtures and coffee and tea. Make sure to use gloves. You may think this natural stain will not stain your fingers, but it is just as bad or worse than other stains! You can apply the stain with a rag or a foam brush. If you are working on a large area, do not let the wood dry between strokes or you will get streaks. So make sure to pick a method that is right for your size of project. Start by applying a coat of the brewed coffee or tea (make sure to cool it first). Give the wood a through coat, but do not soak it. Do not let the wood dry. Immediately, follow the layer of coffee or tea with a layer of your vinegar mixture. Make sure the vinegar mixture does not dry between strokes or you will get streaks. The color will start to appear immediately on the wood, but will darken as it fully dries. Give it 2-3 hours before you will see the finished color. 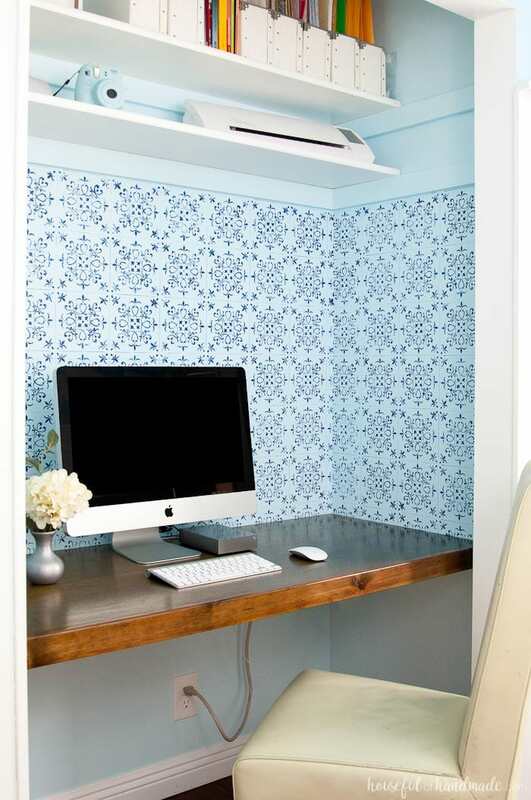 Finish off your project with a finish of your choice. 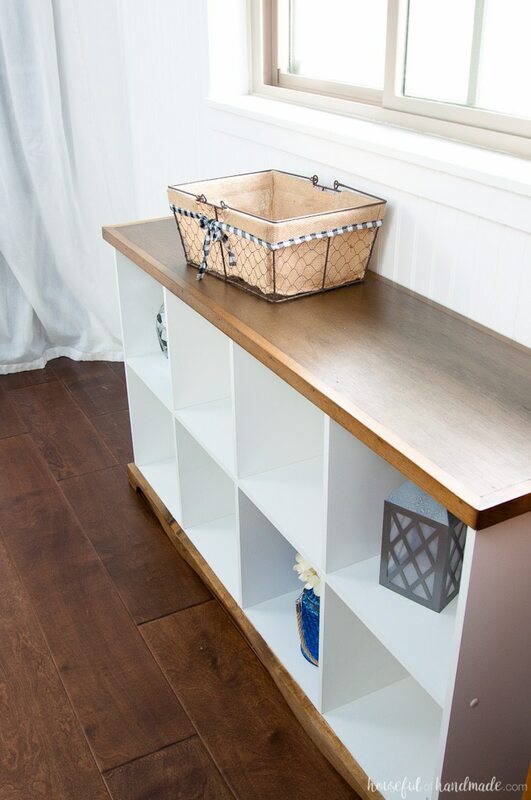 The DIY wood stain is water-based so it doesn’t offer any protection to the wood surface. I have used both wax and polyurethane finishes on my projects stained with natural wood and both have worked great. Pick a finish that will hold up to the use your project will get. 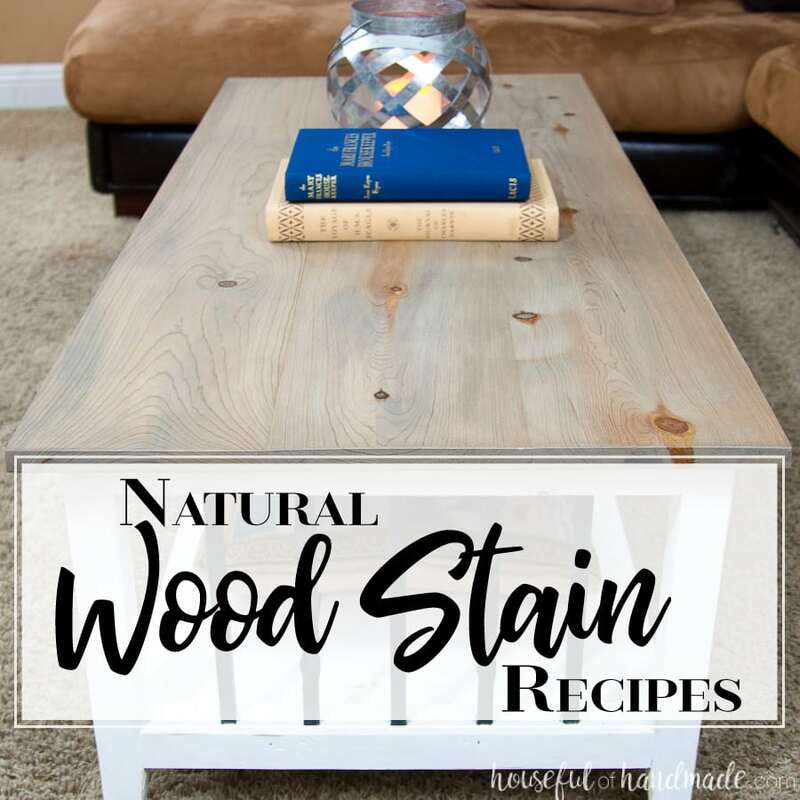 Have you tried any natural wood stains? Share your favorite recipe in the comments.